EERS is pleased to share information below for our conference sponsor partners. Click the logo to learn even more about each. Founded in 1972, PHMC is committed to creating and sustaining healthier communities through direct service, partnership, innovation, policy, and research. The nonprofit serves more than 350,000 clients annually through 350 programs designed to meet a broad array of needs. The Division of Teaching and Learning in PHMC’s Research & Evaluation Group helps clients measure impact and build partnerships between and among K-12 schools, universities, and other educational institutions to help ensure everyone’s opportunity to learn. Shaffer Evaluation Group is a small, woman-owned consulting and evaluation firm specializing in K-12 and higher education program evaluation. Its research team brings experience as classroom teachers, school district administrators, and college faculty to every evaluation project, offering rich professional insights to build strong programs for student success. Philliber Research and Evaluation is a full-service evaluation firm based in Accord, New York with offices in Cincinnati, Sacramento, and Portland, Oregon. To meet the needs of our clients, we design evaluations, develop instruments, collect data using surveys, interviews, observations, and assessment instruments, analyze both quantitative and qualitative data, prepare reports and disseminate results. Via is passionate about their work! 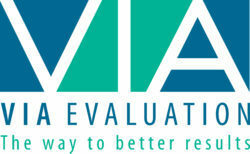 The Via team will help you gain a better understanding of evaluation and data, and you’ll have access to experts who know how to apply rigorous, up to date methods. When you work with Via Evaluation, you can expect user-friendly insight and meaningful recommendations – all so you can ensure a more positive impact on those you serve. For more than 30 years, Equal Measure has partnered with foundations, nonprofits, and public entities—helping them “do even better” as they work to advance social change. In this partnership, we help our clients apply new ways of thinking and learning to achieve their program objectives through five service lines: program design, evaluation, capacity building, technical assistance, and communications. As a core component of this approach, we help our clients identify the root causes of social injustice from multiple historical, cultural, systemic, and structural points of view. Blending these perspectives provides clients with the best, most nuanced thinking to achieve their social change objectives—and enables us to help our clients make their communities stronger, healthier, more equitable, and more inclusive. At Barbara Goldberg & Associates, LLC, program evaluations are partnerships that value and involve program users, give decision makers data they need for the future, and inform the field with practical solutions. Our individually designed evaluations prove the value of programs that are soundly developed, honestly assessed, responsibly refined, and efficiently executed. Such programs see participants thrive and organizations and communities flourish. Our small, woman-owned firm provides mission-driven organizations with expert research and development guidance. We constantly strive to answer questions important to communities and society at large using the latest social science research. Dedoose is a web-based application that allows you to organize and analyze research data, no matter what form those data take. Whether your research data are qualitative—text, audio, images, or video, quantitative—spreadsheets, surveys, test scores, ratings or demographics—or a mixture of both, Dedoose’s design is flexible enough for you and your team to apply whatever methodologies you choose. Dedoose supports both qualitative approaches and mixed methods approaches to data interaction and analysis in a secure, collaborative environment.